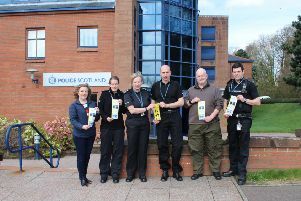 Four people, including a 71 year-old man, are expected to appear at Dumfries Sheriff Court today, (Tuesday 12 September) after £50,000 worth of heroin was seized by police. Police Scotland report that they seized heroin with a value of around £50,000 and a large quantity of cash near Dumfries on Monday 11 September 2017. Four people, two men aged 71 and 41 from Dumfries, a 35 year-old woman from Dumfries and a 43 year-old man from Paisley were all arrested. A report has been submitted to the Procurator Fiscal in relation to the matter.